Tunisian club Carthage Eagles are the first ever champions at the African Ice Hockey Cup, which took place in Morocco over the past week. In a very closely contested final game, the Carthage Eagles are the very first champions of the African Ice Hockey Cup following an 8-7 victory over the Rabat Capitals from Morocco. The Eagles, featuring many players from Tunisia’s national team that participated in exhibition action back in 2014, had no issues throughout the tournament, defeating Egypt’s Cairo Anabus 19-0 on the opening day. The team followed it up with an 11-6 victory over Algiers Corsaires from Algeria before defeating the Morocco Mallers 11-8. That set the pace for the final game, which saw the only two unbeaten teams battling it out for gold. In the end, Carthage would score the extra goal needed to take the victory, finishing off the tournament with a perfect record for Tunisia’s first championship in an international competition, whether it be with the national team or a club team, at the men’s level. The tournament was the first ever African Ice Hockey Cup, a tournament designed to help teams in Africa that have very little chances to play. Organized by the Royal Moroccan Ice Hockey Federation, it was a historic tournament on many levels. Of course, Tunisia had their first form of hockey success, but it was also the debut of Egypt at a tournament of this nature. The team failed to take a victory, but they did lose by a close margin of 2-1 in their final game against the Casablanca Bears. For Algeria and the Moroccan clubs, it was the first time that many of the players had played in an international tournament since the 2008 Arab Cup, the first, and only version of the tournament. Ice hockey in Africa is slowly developing, with South Africa being the only team participating in international play. Morocco is currently an IIHF member, while Namibia, who did not take part in the tournament, participates in inline hockey. The hope is to see this tournament grow in the coming years and allow teams in Africa the ability to grow, similar to how the Challenge Cup of Asia has had a positive impact on hockey in the continent. For a country that is best known for its tropical islands and virtually untouched by winter, playing ice hockey seems to be limited to video games. However, with four rinks in the country and recent admission as a new associate member of the International Ice Hockey Federation, the Philippines is destined to add another chapter to what many believed was Mission Impossible. The Philippines is a country in Southeast Asia consisting of over 7,000 islands and with a population of 105 million people. Ice is locally best known to put on cones or to refresh drinks with but not to skate on. Nevertheless there are 211 players from five clubs registered in the Philippines where four ice rinks can be used, the main one being the SM Mall of Asia Ice Skating Rink in Pasay City next to the capital of Manila. The other ice rinks are at Megamall, Southmall and the Seaside Cebu Ice Skating Rink. IIHF.com’s Joeri Loonen learned more about the past and future of ice hockey in the country and talked with Tournament Director Francois Gautier and training and development manager Carl Montano. With no neighbouring country big in the sport, the Philippines had developed its own style of hockey. It took Montano a while to get used to how hockey was being played and he slowly started to make adjustments. Back in those days there was no organized leagues yet. The teams played pickup games and were primarily formed out of expats. The Philippines did participate in regional invitational tournaments but rather than being an official national team it was an exclusive selection of club players. “We noted the pickup games were gaining more attention and people were fighting for spots. With that increase we felt with some better organization we could start up a formal ice hockey league and federation,” Montano remembers. With a federation (FIHL) in place, the focus on establishing a true national team also became more viable. Gautier found out that it wasn’t as easy as just selecting the best players. “To actually call it a national team, you need to have everyone involved and look at every player available. So having a federation that unites every group was a very big step,” says Gautier, who also had to deal with resistance. Receiving IIHF membership is considered a major milestone. Alongside this recognition the federation also received membership of the Philippines Olympic Committee and as such the national team can apply to participate in official international tournaments like the Challenge Cup of Asia and the Southeast Asian Games. “Exciting times are ahead of us and it was certainly worth the ride. This will give us the opportunity to gain exposure locally and internationally which is something we are really in need for,” Gautier explains. And help is needed. Even though the sport’s is gaining popularity, ice hockey remains a very expensive sport in a country where the average income is around $300 a month. On average, players practice twice a week at a cost of $20 to cover for the ice rent. That prorates to over a $1000 annually which is still excluding the costs of transportation, gear and costs for participating in international tournaments in countries like Singapore, Indonesia, Thailand and Malaysia. With the national ice skating union mainly focusing on figure skating, a sport the Philippines has a local hero in Michael Christian Martinez, who has made his way to the most recent Olympic Winter Games, Montano and Gautier are looking for other means to reduce the cost of playing. FIHL president Christopher Sy is trying to reach out to his connections within other corporations and is now noticing that with the international recognition, the federation is being taken more serious. “Furthermore we are looking to open up international contacts, for example to get gear from abroad. We have had talks with the Canadian ambassador here to see if he can help out with someone who can help us provide hockey gear,” reveals Montano. The national team players, although far from having reached domestic celebrity status, would be available for a meet-and-greet in order for the kids to team up with a real ice hockey player. One thing that would draw national attention surely would be the presence of a real NHL player, especially when of Filipino descent. “People here are very America-oriented in sports. However if we could get Matt Dumba here to provide a few clinics that could be a game breaker for ice hockey in the Philippines,” Montano aspires. Currently a player of the Minnesota Wild, Dumba is the only player with Filipino roots that has made it to the NHL and could serve as the ideal role model for Philippine kids who are interested in playing ice hockey. Montano and Gautier are noticing that the domestic interest in the game is growing. “Ever since the news broke out that we were admitted to the IIHF, a lot of people start signing up. In the past it was hard to get people to practice now it’s hard to get them off the ice,” Gauthier jokes. Rather than to scour the globe for players with a Philippine passport, the FIHL is aiming to build from within. “There is great belief in the players that brought IIHF membership to our country. They went through the hard part and it would be discouraging and disheartening if we’d now suddenly replace them with guys from abroad,” believes Montano. With limited funds available, the goals are clearly long term. “We are focusing on youth and development. We don’t have an established top to bottom supply of players, so we need to start getting more kids playing hockey in order to build a strong core of players that can play at the senior international level in the future,” says Gautier. It required a lot of persistence and hurdles to overcome in the last decade to get where Philippines ice hockey is today. The work is not done yet though. The next couple of years are not just about getting results and winning medals and trophies. The targets are far beyond that. They haven’t played an official IIHF event yet. One of their top players is from California. They won their first ever game 8-2 despite never playing on ice beforehand. Meet the Falkland Islands, the smallest hockey nation in the world. For those not familiar with the Falkland Islands, they are one of the 14 British Overseas Territories. Another member of that group, the Cayman Islands, has played ice hockey previously, competing in the 2005 World Pond Hockey Championships in Canada. So what business do the Falkland Islands have playing ice hockey? Well, they may seem like the ultimate underdog, but their success has been evident after just two years. Like many hockey teams where ice isn’t easily available, the Falkland Islands got their start in DEK hockey, or ball hockey to others. DEK hockey began on the island in 2006 by a player named Grant Budd, a former British Hockey League player who went on to create the Peterbourgh Islanders, currently playing in New Zealand’s second division. The team had the funding to take part in the International Street and Ball Hockey World Championships in Newfoundland, but the team couldn’t get the 17 players needed to compete in the tournament, which truly was a shame. Despite that disappointment, hockey has continued to grow in the small area for years. It wasn’t just adults taking part every week, as young kids started to show interest. The men’s division has four teams, all named after NHL clubs, with four teams also taking part in the youth division. Eventually, the potential to participate on the ice became a reality. According to Martyn Barlow, the chairman of hockey on the Islands, people began to really believe in the idea of hitting the ice after learning about the 2015 Copa Inverda in Chile, the first tournament the team ever planned on entering. Getting prepared to play on the ice took some time. Getting equipment wasn’t easy, especially in an area where specialty hockey stores aren’t a thing. Oh, and are no ice rinks in the area, so that was a problem too. Or, was it? To get ready for the 3-on-3 Copa Inverda event, the team started using inline skates and a puck to get their feet moving. With no ice to play on, they had to stick on gym floors to get used to moving around on some sort of blades. In June of 2015, the team announced their intentions to play ice hockey. On July 2nd, at the 2015 Copa Inverda, that became a reality. It may be one of the most successful starts for a national hockey team, grabbing an 8-2 win over Santiago Yetis, the hometown team, in the opening match. With a population of just about 3,000 people, the smallest hockey nation on the planet was able to make history with the victory, one of many in the tournament. The entire tournament proved to be a massive success for them. The team finished that up with 14-3 and 6-3 victories over the next two days, earning them a spot in the finals of the four-team tournament. With three wins in three games, the team needed just one more victory to sweep their debut tournament, something that is incredible for a team at any tournament. Their final opponent? The Rio Grande Dragones from Argentina. The Islands had a good result against them the day before, beating them 6-3 in the final round-robin game of the tournament. With 28 goals in the first three games, the Falkland Islands had an advantage heading into the fourth and final game. The advantage held true. For the third straight game, the Islands allowed three goals against, but their nine in the other net proved to be the difference as they were good enough to win the Copa Inverda title. In a short period of time, and without extensive training, the Falkland Islands national hockey team were champions, and well deserving of it. The 2016 Copa Inverda saw further Falkland Islands participation, with the men’s team playing in the main tournament while four youth teams battled it out in the children’s division. For the national team, the tournament started off strong, beating the Andean Club of Ushuaia easily 11-2 to open the tournament. 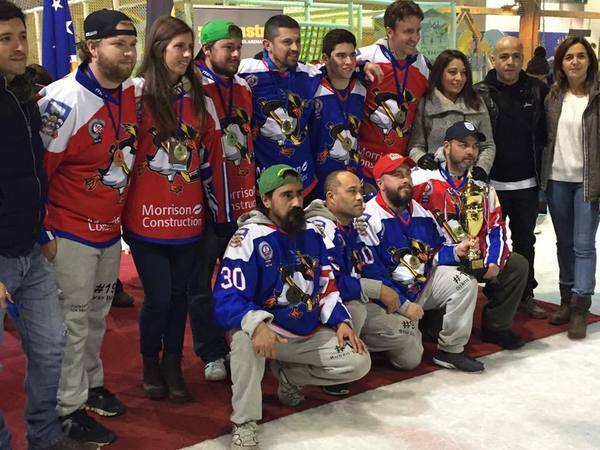 But on July 7th, 2016, for the first time in their short time in the sport, the Falkland Islands failed to take the victory, losing 6-5 in a crazy game against the eventual champions, the Santiago Yetis from Chile. The Islands lost out on a chance to play in the finals as a result, but they still managed to beat the Drakon’s, also from Chile, 7-4 to win the bronze medal overall in the six-team tournament. So what’s next for the Islands? The team would love to continue building their inline program so they can send teams away for national championships. Building from the grassroots level is going to be important for both ice and inline hockey, and the skills you learn in inline can transfer over onto the ice once the country has built an ice rink. Of course, that’s expensive and not always easy when a team is brand new, but it’s necessary to participate in official IIHF events in the future. Sometimes, it’s not always about the resources or financial backing that makes a team good. In some cases, it’s about the heart the players put into it. This is a team that knows what they want and have overcome obstacles to make an impact in a short period of time. You need the commitment that the likes of Grant Budd, Martyn Barlow and all the parents that help make the program successful to have a strong base to build around in the future. And, boy, they are definitely committed. With 35°C (95°F) announced today in the Moroccan capital of Rabat, ice hockey may not be the first thing to come in mind for locals and tourists walking through the royal city. But going to the cool ice rink at Mega Mall is exactly what six hockey teams from North Africa will do this week. For the first time the Royal Moroccan Ice Hockey Federation will organize the African Ice Hockey Cup for club teams that will take will start tonight in two groups of three teams followed by the semi-finals on Thursday and the medal games on Saturday. An all-star skills contest will additionally be staged in Casablanca. This new competition and format gives many players and their six club teams from four countries the first chance to compete across their borders in a region where ice hockey is in its early development. In Morocco ice hockey is played at malls in the capital of Rabat and a one-hour journey south in Casablanca. The one at Rabat’s Mega Mall is 40 on 20 metres and allows playing 3-on-3 games for the African Cup. Of the four countries Morocco has reached out the most so far. The national team played in the first and only edition of the Arab Cup organized in 2008 in Abu Dhabi, welcomed teams from France and Spain in Rabat during the past few years, sent peewee teams to Quebec and was part of last year’s World Girls’ Ice Hockey Weekend. The Rabat Capitals, the Casablanca Bears and the Morocco Mallers are the three teams from the host country to play in the event. With the biggest ice rink less than half the international size, not everything is perfect to develop the game in Morocco but the conditions in Rabat may still envy the visitors from the other three North African countries to take part in the event. In Algeria and Tunisia no ice hockey is played and the movement to bring the sport to their countries is led by the diaspora abroad. While there are no competitions in these countries that would allow hockey to grow and give the base to form a national team, the Algerian and Tunisian hockey diaspora convened to form club teams for the tournament in Morocco. The Algiers Corsaires will come together to represent their country in Morocco. It will be the first such game for many of the players since Algeria played in the 2008 Arab Cup. Like eight years ago the team will be led by British-Algerian forward Karim Kerbouche. All team members play abroad as there are only temporary ice rinks during the winter months at best in Algeria. In Tunisia the hockey movement is led from Tunisians abroad, in particular by Ihab Ayed, who normally plays for the Courbevoie Coqs in the fourth tier of French hockey. It’s in the Paris suburb where Ayed organized his Tunisian team’s first game in 2014 that ended with a 6-5 win for the local team. In Rabat the team labelled Carthage Eagles will for the first time play against North African rivals. In Tunisia like in Egypt there are ice rinks but none of them is bigger than 300 square metres, which is one sixth of the area of an international size rink. While the Algiers Corsaires and Carthage Eagles are formed of players from the diaspora in Europe and Canada, the club team from Egypt is actually based in the country where ice hockey competitions take place on the small ice rinks. The Anubis Ice Hockey Team from Cairo will fly from their country to Rabat to become the first Egyptian ice hockey team to play in an international competition abroad. Host Morocco is the only of these countries that is a member of the International Ice Hockey Federation. The continent’s biggest country in ice hockey is 8,000 kilometres away: South Africa where ice hockey has been played since the ‘30s and that has been playing with its national teams in IIHF competitions since 1961. Additionally, neighbouring country Namibia is an affiliate member of the IIHF that has played in inline hockey. The career of one of the best Slovenian ice hockey players, Tomaz Razingar, officially ended last weekend. The player, who was the country’s flag bearer at the 2014 Olympic Winter Games in Sochi, hasn’t been playing on the professional level since 2015, but his career officially came to an end with the farewell charity game in his hometown of Bled. “It is nice to see that people cared and still care about you. Thank you to all who were with me on the ice on this summer day. Thank you to all who were with me for over 20 years of my career,” the long-time Slovenian national team captain said and added: “I am happy for all my teammates who succeeded at this beautiful game. If it was not for them and for all the coaches and my parents, who had put me on skates and supported me, and of course my family, who believed in me when many people didn’t, I wouldn’t be standing here today. Hockey is a team sport in which we need to help each other. Razingar’s farewell game was of a charitable nature, and was marked by many nines – his jersey number. Proceeds from the ticket sale and the auction of game jerseys will go to the maternity ward of the General Hospital Jesenice. His farewell was opened by the exhibition game of media representatives and photographers. But the highlight of the day was the match between teams of the best Slovenian players from different generations. Razingar’s team was led by former Slovenian national coach Matjaz Kopitar, and the best Slovenian player Anze Kopitar played in it together with some legends of Slovenian ice hockey such as Bojan Zajc, Valerij Sahraj and Dejan Kontrec. Matjaz Kopitar was also the Slovenian national coach at the Sochi Olympics: “Tomaz was always a team player who never liked to lose. He was always working hard for the team.” And that was paid off in Sochi 2014 where Slovenia earned a historic 7th-place finish. In his career Razingar played for Acroni Jesenice, in Peoria, Worcester, Vsetin, Pardubice, Hradec Kralove, Trinec, Innsbruck, Pustertal, Villach, Ravensburg, Troja-Ljungby and in his last season for Dukla Trencin. Apart from the Sochi Olympics he represented Slovenia in 14 IIHF Ice Hockey World Championship events (8 in the top division), most recently in Ostrava, Czech Republic, in 2015. It started on the ‘Laguna del Diablo’, the Devil’s Lagoon. A small lake on the western edge of town, near the main road, where back in 1979 people in Ushuaia began playing pond hockey. On natural ice, limited to a few weeks of the year, an intrepid band of hockey hopefuls kick-started the process that has turned the capital of Tierra del Fuego into the capital of Argentine ice hockey. Commonly regarded as the southernmost city in the world, Ushuaia has two rival teams – Club Andino de Ushuaia (CAU) and Nires – playing on the only international-size rink in South America. That rink, which is currently an open-air facility, was completed in 2010 and transformed the prospects for the game here in the deep south. Argentine teams are regular visitors to Punta Arenas, which boasts the only year-round ice rink in Patagonia at Cool Center in the Zona Franca mall. And both Nires and CAU agree that events like the Copa Invernada are vital to keep pushing up standards in the region. Plans to build a roof over Ushuaia’s ice could make the game a year-round event back home, but for now the city of 71,000 people stages three tournaments: a local league, a Patagonian championship featuring a return visit from the hockey fraternity in Punta Arenas, and the exotically named Copa del Fin del Mundo – the End-of-the-World Cup – now in its 13th edition. That tournament has welcomed visitors from Chile, northern Argentina and even Brazil, while Zahr has hinted that it could some day extend a ground-breaking invitation to the emerging hockey team on the Falkland Islands. Despite the political tensions between Buenos Aires, London and Port Stanley, teams from Argentina and the Falklands have played against each other in Punta Arenas and Zahr believes the experience can bring people together. But while Ushuaia’s remoteness adds glamour to events like the Fin del Mundo, it also brings problems. Zahr, of the Nires club, said: “We have a rink, but we’re so far away from the rest of the world that it costs a fortune to get equipment down here. Even something as obvious as a Zamboni, for example; it’s expensive in the first place, and then you add on the shipping to bring it here from Canada and the costs go sky high. That limits what we can do, and that’s where we’d really like some support. But there is optimism about the future, especially after the city got its rink six years ago. “Now we’re working on a roof and that would be a huge help because it would open the way for further development,” said Siede. “We could play all year round, and maybe we could even stage IIHF events down here. With South Korea participating at the 2018 Winter Olympics, there’s more interest than ever in ice hockey in Asia. Considered to be an untapped market for most of the sport’s lifespan, Asia has had very few hockey powers throughout history. But that doesn’t mean that hockey isn’t actually thriving in the continent. While most people in North America argue about whether or not the NHL should have teams in Arizona or Florida, the sport actually is seeing some growth in areas such as Bahrain, Indonesia and Uzbekistan. Of course, you know about countries like Russia, Japan and Kazakhstan playing amongst the big boys in the international scene, but who’s a team that really doesn’t get the attention they deserve? The Chinese Taipei, and they’re ready to become one of the biggest risers in the sport. Hockey in the Chinese Taipei has a very strange history, to say the least. The team first hoped to make their debut performance at the 1987 Group D World Hockey Championships, the lowest division of the tournament back in the day. It was a gong show throughout, with Australia beating New Zealand 58-0 in one of the games while scoring 177 goals in a six-game span. If you look at the game fixtures, Chinese Taipei played four games, tying Hong Kong 2-2 before getting completely blown apart from the other teams. But if you look at the standings, they never actually were listed. Funny enough, the Chinese Ice Hockey Federation wasn’t so pleased with the team existing. If you didn’t know, Chinese Taipei is actually Taiwan, and China didn’t really want to recognize them as their own power in sporting events. They did everything in their power to make sure Taipei couldn’t participate in the tournament, and while the IIHF would still allow them to play, they counted their games as friendly exhibitions instead of actual tournament matches. For 13 years, nobody would ever hear from the team again. Heading into the 21st century, people in the country began showing a renewed interest in the sport. In fact, the team returned to action for the first time since their lengthy nap to participate in the 2000 IIHF Under-18 Asian-Oceanic World Hockey Championships. The team was strong in their first two outings, grabbing the silver medal in 2000 and 2001 in the final two years that the Division II tournament took place. The team moved up to Division I for the final year of the Asian-Oceanic tournament, finishing fifth of six teams in a tournament that saw multiple 20+ games in the week-long event. The tournament disappeared in 2003, and with it so did their international effort once again. Some of the junior players would graduate to the men’s team, who, despite the U18 team making a short three-year appearance, had remained doormat. That all changed when the team played three friendly matches with Hong Kong and Thailand, losing 6-2 to the former. Thailand, however, proved to be a little weaker, with Taipei taking them down 5-3 on March 7th, 2005 for their very first ever ice hockey victory at the men’s level. They’d go on to beat Thailand 11-4 before the year was over, giving them their second victory and a bit a confidence for the future. They didn’t know it yet, but the best years were soon upon them. The men’s team took part in the very first Challenge Cup of Asia, a tournament that was set to help improve the quality of hockey in the continent where there was very little room for development. Taipei once again took down Thailand, but only by a mere two goals in a 3-1 victory to open up the tournament. The team then saw disappointment, losing 2-1 in a hard-fought battle with their rivals from Hong Kong later that same day. But then the wins kept rolling in. The nation narrowly beat Singapore 2-1 the day after, only to absolutely blow Macau out of the water. The team then went on to Malaysia 5-2 in the final game, giving them the points necessary to win their very first gold medal while playing with the best players to ever suit up for the nation. Things were looking bright for them. The country began fielding a U18 and U20 team in the years to follow, helping continue their development. But then, of course, they had to skip the 2009 Challenge Cup tournament, which, in reality, didn’t really hurt them that much. In 2010, with the tournament now officially recognized by the IIHF, Chinese Taipei hosted the event for the very first time, a tournament that they simply couldn’t be stopped in. From 2013-2016, no other team has been able to dethrone Taipei as the top hockey nation at the Challenge Cup of Asia. Specifically, no goalie has had any luck against To Weng, who has 62 points in just 20 games for the team in CCoA action. Five players have participated in 20 games with Taipei, with the team failing to show any struggles in recent years. The country also has a small, yet competitive domestic league, which is important for the success of any small nation. This past year, the Taipei Broncos beat the Taichung Lightning for the league championship. A good portion of the national team comes from the Taipei Silver Monsters, led by Weng’s offensive instincts. What’s in the future for the team? The team will feature in the 2017 Asian Winter Olympic Games, which could feature in the ballpark of 20 teams. It’s unclear what type of roster teams like Kazakhstan, Japan and South Korea will feature, but it would be wrong to think that Chinese Taipei couldn’t go far in the tournament, which is seen to be as a huge stepping stone for the future of Asian ice hockey. Rumor also has it that they’ll meet up with the United Arab Emirates to decide who’ll get a spot in Division III for 2018. Whether or not that ends up happening is unsure, but if they do decide to go to the World Championships at some point, watch out. Some steps away from the ice rink at the Sport Institute of Finland in Vierumaki other programs of the 2016 IIHF Women’s High-Performance Camp took place in classrooms. It’s here where administrators from 15 countries visited the Long-Term Development Planning program to learn more about converting dreams to plans and on strategies to hopefully make them come true. While the team program with the players and team staff focused on Olympic-prospective countries, this program was open for all IIHF member countries and covered a wide range of topics. “You’re looking for things like goals, objectives, measurable incomes, getting people to think long-term and think of a number of things to address and to prioritize and build time frames for them,” said Paul Carson, who together with Steve Norris led through the program. They learned how to build development plans, to find the need inventory and plan based on it, about measurables, about model organizations, building leadership capacities and get the support to build the plans they were presenting to their colleagues. Peeter Kirtsi from Estonia focused on building a network of ice rinks to increase the capacity for ice hockey in a country that is surrounded by hockey countries such as Finland, Russia, Latvia and across the Baltic Sea by Sweden but where ice hockey isn’t as big and only played in a few cities. The idea is to build rinks in the regions of Tallinn, Ahtme, Narva, Tartu, Viljandi, Rakvere, Parnu, Valga and Voru. That would lead to more players but it needs a lot of persuading with local authorities. The ambitious goal is to increase the number of rinks by 2020 from five to 11, the number of players from 1,400 to 2,600, increase the number of youth hockey clubs from seven to 12 and grow the men’s league to a minimum of seven teams. Several participants addressed officiating including Jonathan Albright from New Zealand and Daniela Montes de Oca from Mexico, who want to increase the number of officials with new initiatives. In New Zealand there are only 66 on-ice officials for 1,340 players. “The leagues have grown but officiating not. There’s a lack of understanding of the new IIHF rules. No officials from New Zealand were awarded assignments in the 2015/2016 and 2016/2017 seasons,” Albright said and believes that due to the low standard of officiating the national teams get too many penalties in international ice hockey causing a bad reputation. The unbalance is even worse in Mexico where only 19 referees (including three women) are registered and 1,900 players. Most games have to be officiated with two officials, the more important games with the three-man system. “We need to create an educational and recruitment program and work closer with clubs,” she said and hopes to bring in a foreign, Spanish-speaking person for an international course. Attila Somogyi addressed a similar issue in Hungary but with getting more off-ice officials through a new development program while Franc Aci Ferjanic from Slovenia addressed the need of more on- and off-ice officials in his plan. Another participant who came from far away was Harjinder Singh, the General Secretary of the Ice Hockey Association of India with his project “India 2020” to grow ice hockey in India in all aspects by growing in the regions and have more learn-to-play programs and camps and collaborate with other sports such as ice skating and inline hockey. There are plans for two international-size ice rinks that would help the sport that is currently mostly played on frozen ponds in areas close to the Himalayas. Additionally Singh hopes to equip six outdoor rinks with dash boards and for additional small rinks in shopping malls. Also in its early development in ice hockey is Kyrgyzstan, one of the newer IIHF members. “One has to start somewhere” was the slogan of Maria Urpi, who wants to create an organizational framework for the federation and promote ice hockey as a sport. With little money available in the country, volunteers have been selected to work with the federation. Burkay Altunas showed the fast growing hockey landscape in Turkey with rinks and clubs in Ankara, Istanbul, Erzurum, Izmir and Kocaeli and more rinks under construction in other cities such as Edirne, Antalya, Adana, Kayseri, Yozgat, Diyarbakir and Van. One issue he addressed is the lack of competition for kids under 14 years of age with few competitions and kids that can barely skate. He wants to bring kids born in 2003 and 2004 together in each city to provide them with more ice time, at least twice a week, and at least one game per team once a month. Andrei Putilin presented a project where he wants to introduce a new study program for Belarusian hockey schools where student work on age-appropriate development models to improve the quality of regional junior hockey development, bring modern teaching and practice techniques to hockey schools and restore a national certification process. Mike Horowitz from Israel focused on strength and conditioning, something he has seen first-hand at a world-class level with the players here in Vierumaki. He wants to address coaches and bring the national team players in better shape. Therefore he wants to align the different national teams in terms of systems, testing and off-ice training, and bring the knowledge to the different branches in the states. Analogue to the “hockey girls rock” slogan for the World Girls’ Ice Hockey Weekend program in Vierumaki, Xavier Cherta showed his presentation under the title “Spanish hockey rocks” and ambitious plans to move the sport forward in his country. In Spain the hockey community has to live with few ice rinks due to the warm climate, that the sport is not well explained and therefore seen as dangerous in the population, with too little media coverage and early retirement. “Things don’t change much for players because only five teams play in the top league,” he said. He aims at breaking the vicious circle by making the competition more attractive and create a virtuous circle. “The Spanish Ice Sports Federation has the aim to break the negative dynamic that stops the growth of hockey in our country,” he said and is working on a three-year development plan that includes a consolidation of the national league, attract elite players from inline hockey to create new teams, extend the league to ten teams and create an attractive league brand. Russian Vierumaki student Vladislav Bespomoshnov presented a coaching certification system for the Northwestern region of Russia while Jovica Rus presented a project of the Serbian Ice Hockey Association to use a synthetic ice surface facility in Belgrade for skills development all year around in addition to proper ice training with the rental cost being three times less. Most projects were about hockey in general although George Pogacean from Romania had a women’s hockey specific project to promote hockey for girls in the age group 12-14 and work together with schools. “The presentations were outstanding. You can look at one area or several programs and build them in a specific order,” said Carson. Sometimes the enthusiasm for something new was almost bigger than needed though, Carson observed. “Sometimes people forget when they are building that there is already an inventory that exists and that could be built on. I don’t see it just here, I also see it a lot in Canada,” Carson said. It was the fourth consecutive time that such a program was held during an IIHF camp in Vierumaki. Carson originally started it as an Administrators Education Program in 2013. Greek Ice Hockey has been suspend since 2014 we chatted with team Captain of the Greek national team Dimitris Kalyvas who is on a mission to get Greece back on the world stage. Can you tell our audience little bit about yourself? Well, I was born in Montreal, Canada and moved to Greece at a very young age. I started playing hockey in Montreal, as most kids did back in the 70s, and fell in love with the sport. Moving to Greece was a lot easier when I found out that ice hockey is being played there. I started playing hockey in Greece from the minute the plane landed in 1989 and haven’t stopped since. As for the National Team, I was a member of the first Junior National Team that was formed in 1989. In the Men’s Team, I become captain from 1998 and remained until the last National Team in 2013. I’ve participated in 8 IIHF World Championships and I am the all-time top scorer of the National Team. How did ice hockey get started in Greece? Ice Hockey started in Greece in 1984 by players that returned to Greece from abroad. There was a small ice rink in Athens. No boards, no Zamboni. But, it was ice hockey! At the beginning, it was just games being played amongst friends, but very soon things started to organize. Team were formed, a Federation was created (1987), and the first Junior National Team participated in the IIHF World Championships in Yugoslavia in 1989. Greece played at the IIHF World Championships from 1992 – 1999 and from 2008 -2013, what happen between 1999 and 2008? In 1999 our last ice rink closed down and the IIHF did not allow us to participate anymore. After this decisions, players of the National Team started trips to the Czech Republic to take part in various tournaments. This lasted several years. In 2006 I went to the IIHF Annual Congress in Riga, Latvia as a delegate of the Hellenic Ice Sports Federation. There I heard a story about Mongolia hockey. A member of the IIHF council told us a story about how a team without a rink struggles to keep their sport alive. Mongolia was taking part in the World Championships at the time. I told myself: “What about a team in Greece doing the same?” When I returned to Athens, I wrote a long email to the IIHF council explaining the situation. I sent photos and game stats and asked the IIHF to re-evaluate our situation. I tried to show them that we had a competitive team and that we were able to compete at the Div.III level. The Greek Federation at the time was not agreeing with my actions. I don’t know why, but I honestly didn’t care at the time since my mission was to get the Greek National Team back in the Worlds. Many people don’t know these details. Actually, I am sure that very few know what I was going through at the time. I continued the emails, the calls and the face-to-face meetings with IIHF officials about the Greek Ice Hockey situation. My resiliency paid off since the IIHF decided to send 2 IIHF delegates to Athens in the summer of 2007 to evaluate our situation. As I said above, our Federation did not agree with my actions and when the IIHF announced that it will send 2 delegates, our president did not tell me when they will be getting to Greece since he basically didn’t want me there. I went anyways. I had a long and great talk with the IIHF delegates. I showed them the progress of Greek Ice Hockey and also explained our struggles and obstacles. After their visit, the IIHF decided in September 2007, at the Semi-Annual Congress in Vancouver (which again I was a delegate), to allow the Greek National Team to participate in the 2008 Qualifications of the World Championships that took place in Bosnia. 2 years later we won a Silver medal. Friends that know the story tell me that I saved Greek Hockey. Who knows. Maybe I did. But I know that if a team didn’t exist back then, I would of never sent the initial email. So I see it as a team effort and a team victory. Why did the IIHF suspend Greece after 2013 World Championships? Greece has 3 rinks but no Olympic size, but unfortunately this is not enough for the IIHF. Why hasn’t the Hellenic Ice Sports Federation fully supported your efforts to get Greek ice hockey back on the Map? I can write a book about this. Before I reply, I want to say that the Federation members have now changed. They are 100% fully committed to helping Greek Ice Hockey. Unfortunately though, 25 years of mismanagement is very hard to fix in a short time. Many people don’t understand this though. The former president passed away (who was president for 25 years) and everyone wanted improvement in just a few months. But like I said, the new management is fully committed and doing everything possible to help, with the little they have. (Government funding has completely stopped for Greek Ice Hockey in the past years, so everything needs to be from private funding or player registration). Now, why the former president didn’t help? I don’t know why for sure, but if I need to reply, I believe it’s because he was getting fully funded by the government for doing the bare minimum, therefore he knew that by growing the sport, expenses will also grow but visibility of the sport would grow as well. Visibility would bring new people to the sport, new sponsors, new funding. This is something he didn’t really want. He had all the funding he needed from the Greek government. He was basically the King and didn’t want to give his crown to anyone else. Being low profile would definitely guarantee him being the King forever. Of course, he passed away recently, therefore I don’t want to elaborate further and he is not here to counter what I am saying. But if I sit down and think about it, I truly believe this is the reason. As I said above though, everything has changed now, therefore I am confident that if the Greek National Team is back in the Worlds, it will be bigger than before. How much as the IIHF suspension hurt the development of Ice hockey? It’s killing the sport. The decline in player registration is incredible. (you can see the graph below) I will be updating it soon with new figures). What I explained to the IIHF is that in developed countries (Canada, USA, Russia etc) the National Team is on the top of the pyramid when it comes to the development of the sport, but in Greece (and smaller countries) the pyramid is upside down – The National Team is the foundation that keeps everything else in place. Similar to any structure, if the foundation is removed, then everything above it will collapse. Without a National Team the government does not fund the sports, sponsors don’t want to give their money to local teams but rather give them to the National Team. This is what I tried to explain to the IIHF. Has there been any indication from IIHF officials about lifting the suspension on Greece? No. I got some momentum after my letter, but it quickly died down. I believe that without an Olympic size rink they will not lift the suspension. Have you or anyone from Greece reached out to NHL players like Chris Chelios to help your cause? Yes, I have. Several times, but it seems that everyone is busy doing other things at the moment. All the NHL-Greeks know about us and know about our cause. Hopefully one day someone will decide to take action and help. What is Greek ice hockey doing now to try to keep Ice hockey alive in the county? Friendly games, tournaments, event. Etc. Nothing fancy but something is better than nothing. We continue to create awareness about the situation with Greek Ice Hockey with the hope that someone will help us. We’ll see. You just had 3 on 3 Greek Cup tournament how did that go? It actually went very well and we will have our second one very soon. I am working on a surprise (don’t want to announce anything before it’s final), but we might have surprise visits in our next one! There was an international tournament played in Ankara, Turkey last month with Georgia and Bosnia are there any future plans to play in these type of events? If we get invited then we might definitely attend, but I believe that these kind of tournament are only for countries participating in the Worlds. It’s an IIHF tournament and I doubt that a suspended team will ever be invited. I hope I’m wrong and we soon see an invitation. How many years was the Greek Ice Hockey League in operation and do you see it coming back in the future? It was on and off. A few years in the early 90s, and then again between 2008 and 2013. It coincides with the National Team participation I guess. When everyone knows that after the Greek League there will be a National Team, everyone wants to help. Even the ones that don’t play on the National Team. Having a league was a pre-requisite for the Worlds, therefore we had our league in order to be able to play in the Worlds. And it was a big league too. In 2013 we had 11 Men’s teams participating. (http://hisf.gr/icehockey/?page_id=200) But after the National Team was suspended, this folded as well. Today, I think there are 3 Men’s team’s actually still playing, and those barely. If the National Team does not compete again, I doubt another Greek League will start again. This is what I told the IIHF. In Greece, the National Team is the foundation that keeps everything else in place. Without a National Team the government does not fund the sport nor do sponsors want to give their money to local teams, therefore everything needs to be covered by the players. Well, as Greece is facing a severe economic crisis, the player rather fund other things, or just come out once a week and play fun hockey with friends. It’s only logical I guess. I hope this changes soon though because I truly believe that Greece can create a great Pro League for all the Greeks around the World. Especially the Greek North American kids that don’t make the NHL. Instead of stopping or going to Europe and playing as foreigners, they can easily come to Greece, play pro hockey for a few years, get their Greek passports and then go play as Europeans in any league. This way, they will help raise the caliber in Greece but also attract sponsors and funding. This has been my dream all along, but without an Olympic rink this cannot be a reality. Back in 1990 we were playing in the same division with Italy, but the Italians did exactly what I described above. Today, Italy participates in the Olympics while we play hockey on our XBOXs. All we need is one Olympic rink and I am confident that Greece will participate in the Olympics one day. Hey, we have no rinks (or smaller rinks) and Greek Ice Hockey still exists. We even won a medal with no ice rink at the time. Imagine what we can do if we had the facilities and the funding. I know it’s a far-fetched dream, but sometimes dreams do come true. You have played your entire career in Greece for club team Iptameni Athens, why did’nt you take your talents abroad? I think timing was not on my side. I had an offer once to play semi-pro in Belgium but it was during my University studies, so I declined the offer. Afterwards, hockey had momentum in Greece again and I didn’t want to leave this behind. I guess deep down inside I wanted Greek Ice Hockey to succeed more than my international career, so I didn’t really pursue this. What have been some of the best games in your career and in Greek ice hockey? The first was in 2008 in Bosnia when we qualified for the World Championship. It was such a great feeling knowing that Greek hockey was back in the Worlds after almost 10 years. I remember we were all crying like babies afterwards as just a few months before we didn’t even know that Greek hockey had a future. September 2007 we were told that we can compete in the qualifications that were held February 2008. So basically 5 months to prepare for the biggest qualifications in Greek ice hockey history! These qualifications changed everything since an ice rink opened only after we qualified, and for this reason only. The government basically said: “If you qualify, we will invest in the rink”. If the team would not have qualified, everything that came after would not have existed today. From the Silver medal, to the kid playing hockey in Greece today. The 2008 qualification changed everything in Greek Ice Hockey. The greatest though was in 2010 when we won the Silver medal. It was like a huge load was lifted off my shoulders personally. Like all the sacrifices and efforts finally paid off. Like I said above, many people don’t know everything that I have gone through all these years trying to get Greece back in the Worlds. I am a kind of person that doesn’t like to advertise actions as I believe that the results are enough for people to understand that the work has been put in. I worked hard to get Greece back in the Worlds and people that were close to me know my efforts, the obstacles that I had to surpass, the difficulties I went through, the enemies I made and the friends I lost. It was a very tough for me, but I would do it all over again knowing that for 6 years Greece was taking part in the World Championship, won a Silver medal and came very close in advancing to Division 2. It was all worth it. Nothing of course would have happened if the team was not united as we were. Like brothers. I am certain that if the unity was not there, the team would have never accomplished what it did. I am so proud to be part of this team, and hopefully soon we can live great moment with the National Team again. Adam Vay received a confidence lift at the world championships in Russia in May. Vay and the Hungarian national team fell 5-1 to the United States in the group stage, but the margin of defeat would have been worse if not for Vay’s 32 saves. After the game, as the two teams went through the handshake line, Vay piled up the compliments. “A couple guys when we shook hands they said ‘Good job, you did a good job,’ ” said Vay, who made his development camp debut on Monday at Xcel Energy Center. “It was a good boost for me and my ego.”And his professional stock. While Hungary won just one game at the world championship, Vay stopped 91 of the 100 shots he saw in the tournament — including a 45-save performance against Finland, who went on to win the silver. That caught the attention of several NHL teams, including the Wild. The only problem for Minnesota, assistant general manager Brent Flahr said, was Vay didn’t even have an agent for the Wild to contact. But by that point, agents were fighting over the chance to represent Vay. One of Minnesota’s goalie consultants knew the Hungarian coach, so the Wild were finally able to reach Vay, and he was immediately intrigued by the opportunity to potentially see NHL playing time. “Minnesota was the best opportunity for everything,” Vay said. “So I said the first time ‘OK, yes.’ ”Vay signed with the Wild on May 18. Vay touched on the disparity of play between Hungary and the rest of the teams at the world championships. Hungary isn’t a hockey hot bed. A few Hungarians have been drafted, but no players from Hungary have ever skated for an NHL team. Vay could be the first. Vay, who moved to Slovakia for six years when he was 10, said people in Hungary laughed at him when he’d state his mission. Now he has believers, for good reason. Flahr said the 22-year-old goaltender has “terrific” athleticism, is in great shape and is highly competitive. Oh, and he’s big, too. The roster lists him at 6 feet 5, 228 pounds. Vay looks like an NHL goaltender.“You can’t teach the athleticism that he has and the size that he has,” Flahr said. Still, there will likely be an adjustment period for Vay. Flahr said it’ll be important for Vay to see plenty of ice time early on, mentioning the difference in the North American rink size and playing with traffic in front of the net as potential challenges. That might mean playing for Iowa in the American Hockey League would be a better fit initially. If Vay does that, it’ll be a historic Hungarian achievement.